Make sure you get yourself to the wedding on time and in style. Find out how to book a limousine-plus some alternatives to consider. • For any kind of rented transportation, from stretch limousine to horse-drawn carriage, be sure to confirm your reservation a week in advance and again, for good measure, the day before the wedding. A no-show driver would not be a good start to your wedding! 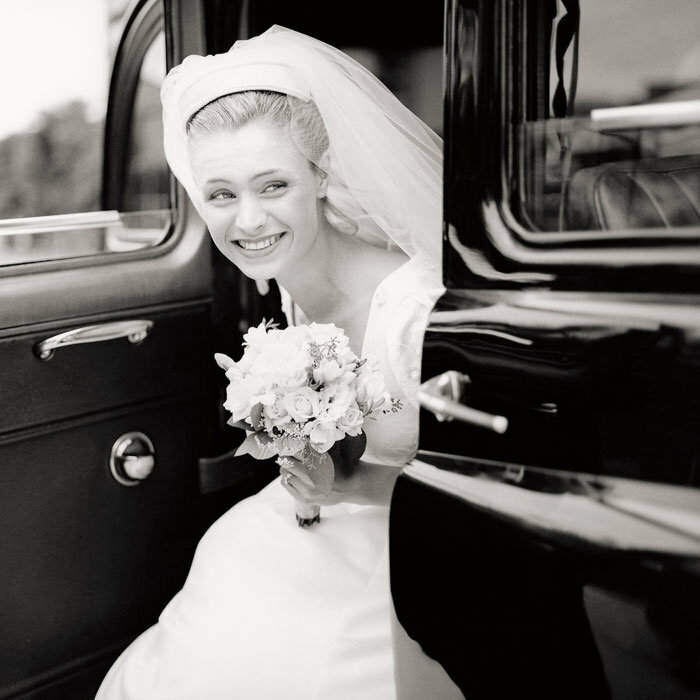 • If you're very particular, ask to see the exact cars that will be sent on your wedding day, and mark down their license plate numbers on the contract. • Considering an unusual vehicle for your arrival or departure? Think about your dress. Pedaling a bicycle built for two in a slim sheath may not be physically possible, and emerging from a low-slung vintage Porsche in a ball-gown skirt may not be the graceful entrance you imagine. But if you can carry it off, by all means get creative. Depending on your preferences and budget, there are several options to consider when arranging transportation for your wedding day. If you need to accommodate a large group, limousines are a popular option—one for the bride and bridesmaids, one for the groom and groomsmen. For smaller parties, or just for their own use, some couples opt for an antique car, town car or horse-drawn carriage. Get creative—arrive at the church in a trolley car or decorated bus and depart in a rowboat, on a bicycle built for two, or on matching motorcycles. Ferrying the members of the wedding party about is your responsibility, and it's not a bad idea to arrange transportation for parents of both bride and groom, too. So consider: Do you want to ride to the church with your bridesmaids, or would you prefer a quieter trip with a close family member? Would you like to leave the ceremony alone with your new husband, or would you rather merge bridesmaids and groomsmen for a raucous ride to the reception? These choices will affect the size and number of vehicles needed, so think them through in advance. When booking limousines (best done about three months in advance, or earlier if you're in an area with few options), make sure you're dealing with a reputable company. Get a referral from a trusted friend, speak to former customers and check with the local Better Business Bureau to check a firm's reliability. Find out whether the drivers will wear uniforms and, if it's important to you, ask whether you can have champagne or other alcohol on your trip. You can also visit limousineline.com, a free web site that allows you to scout costs for rides (in your area and internationally) among hundreds of companies. You'll be asked to enter info like your wedding date, time and location, and you can specify what type of cars you want, from stretch limousines to minibuses. When you're ready to book, you can place a bid, a la priceline.com. You may just snag yourself a deal! Once you've made your choice, be certain drivers know when and where they need to be on your big day, including all stops and waiting periods—you don't want to argue with your driver en route to the ceremony about whether stopping to pick up a bridesmaid will cost extra, and you don't want to worry about getting lost. Get all the details in writing when you reserve your vehicles, and you'll arrive and depart in style.